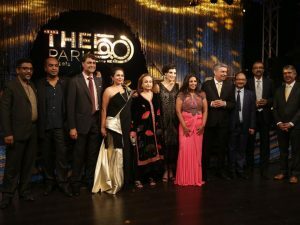 The Park Hotels brought its year-long Golden Jubilee celebrations to The Park New Delhi on September 22. The event was presided over by Priya Paul, Chairperson, Apeejay Surrendra Park Hotels and Vijay Dewan, Managing Director, The Park Hotels. Speaking on the occasion, Paul said, “50 years is an important milestone and I am grateful to everyone who has been a part of The Park Hotels’ incredible journey. Our remarkable success is due to our solid foundation and values. Our vision of ‘Leadership Through Differentiation’ is manifested by each of our 15 hotels across India. My outstanding team and I look forward to creating unique experiences for customers and more value for our stakeholders.” The Park Hotels’ 50-year celebrations continue across India and will culminate at The Park Vishakhapatnam which also turns 50 in 2018. About 50 years ago, Late Jit Paul and Late Surrendra Paul took the hospitality industry a notch higher when Apeejay Surrendra Group’s first hotel The Park Kolkata, a contemporary luxury property was opened on November 1, 1967. Since then, The Park Hotels has taken the path of creating a unique collection of luxury boutique hotels. Tapping into the ever-shifting pulse of society, the edgy design and imaginative spaces have brought together the pioneers of creativity to engage with each other and with the hotels. 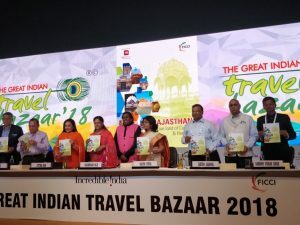 The 10th edition of Great Indian Travel Bazaar (GITB) opened with 280 foreign buyers from 55 countries and 270 exhibitors at The Lalit Jaipur on April 22. Committed to boost tourism in India, the inbound show was inaugurated by Vasundhara Raje, Chief Minister, Rajasthan; Rashmi Verma, Secretary, Ministry of Tourism; Jyotsna Suri, Chairperson, FICCI Tourism Committee; Dipak Deva, Co-Chairman, FICCI Tourism Committee; Nihal Chand Goel, Additional Chief Secretary (Tourism, Art & Culture), among other officials from the Government of Rajasthan. The show, celebrating a decade of successfully promoting inbound tourism in Rajasthan, hopes to cross the 11,000 mark in terms of pre-scheduled B2B meetings between the exhibitors and buyers. Raje said, “It is heartening to see such an enthusiastic participation at GITB. The tourism sector has seen a new vigour and dynamism after the launch of the campaign ‘Jane Kya dikh Jaye’. Our vision was to get 50 million tourists in Rajasthan by 2020 but by the end of 2017 itself, the state received 47.5 million tourists and we would compete our target by the end of 2018.” Raje also thanked the central government for the financial support provided for the state’s various tourism projects. An MoU was also singed on behalf of the Government of Rajasthan and FICCI under which the GITB will continue to be hosted till 2024. The dates for the next edition of the show in Jaipur are April 28-30, 2019. Rashmi Verma, Secretary, Ministry of Tourism, Government of India, will lead PATA India Chapter as its Chairperson for the term 2017-19. 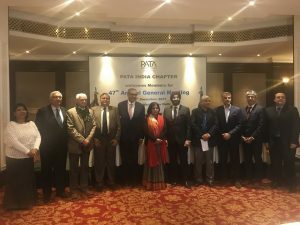 This was announced during the 47th Annual General Meeting of PATA India Chapter held at The Claridges, New Delhi on December 19. While SanJeet, Director, DDP Publications, was re-elected as the association’s Vice Chairman; J.S. Taneja, MD, Travel Spirit International, will continue to hold the post of Hon. Secretary, and the post of Hon. Treasurer has been re-assigned to Vikram Madhok, MD, Abercrombie & Kent. The association also elected its Executive Committee for the term 2017-19. 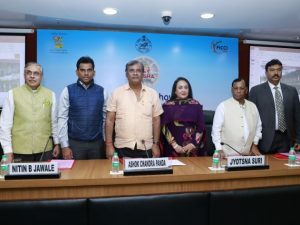 Under the Active Government Category, Rashmi Verma and Suman Billa, Joint Secretary, Ministry of Tourism, Government of India will hold the post, while Ravneet Kaur, CMD, ITDC and Sanjiv Garg, Additional Member T&C, Ministry of Railways will be EC members under the Associate Government Category. Pankaj Srivastava, Director-Commercial, Air India, has been elected EC member under the International Carrier category. Under the Domestic Carrier category, Ragini Chopra, VP, Jet Airways and M.P. Mall, CMD, IRCTC have been elected. The four posts for Travel Agents/Tour Operators category have been given to Vikram Madhok, J.S. Taneja, Snirmol Ghosh, Director, Indo Asia Tours and Anoop Kanuga, Director, Bathija Travels. 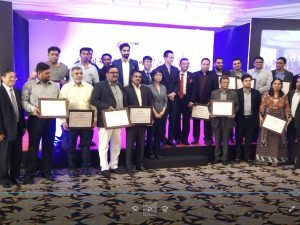 Under the Hotels/ Associate Hotels category, the three members are: Renu Basu, VP, Indian Hotels; Arjun Sharma, MD, Select Holiday Resorts; and Rohit Arora, GM, Apeejay Surendra Park Hotel. SanJeet will be an EC member under the Sustaining Member category. The Great Indian Travel Bazaar opened with 275 foreign buyers and 288 exhibitors at The Lalit Jaipur on April 23. The inbound show committed to boost tourism in India and in Rajasthan was inaugurated by Suman Billa, Joint Secretary, Ministry of Tourism, Government of India, and Krishnendra Kaur, Tourism, Art and Culture Minister, Government of Rajasthan, Jyotsna Suri, Chairperson, Tourism Committee FICCI, Nihal Chand Goel, Additional Chief Secretary (Tourism, Art & Culture), Bhim Singh, President, Federation of Hospitality and Tourism of Rajasthan, and Rahul Chakravarty, Senior Director and Head-Tourism, FICCI. Addressing the show, Billa said, India is truly on a growth path. We have grown at a rapid pace of 11 per cent in 2016 and since January to date we have grown at a staggering rate of 16 per cent, there is nothing in the market to suggest that it will slow down. Domestic tourism forms a key part of Indian tourism. Last year we had 1.7 billion domestic travellers and we are growing at 8-9 per cent Y-o-Y. Admittedly we are growing on a narrow base but the potential of tourism in India is immense. All of you here are at the right place to lay the seeds for what will become a great engagement for a market that has huge potential. He also informed that accordingly to the World Economic Forum report, India improved its tourism competitiveness by 25 places over three years and tourism is the government’s main agenda. 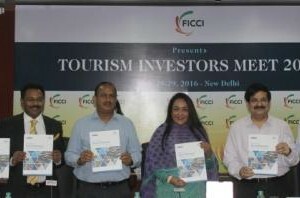 The second edition of the Tourism Investors Meet (TIM) organised by FICCI brings together 72 buyers and seven sellers, who are representatives from difference state governments, and aims to host more than 600 meetings over two days, informed Dr Jyotsna Suri, Chairperson, FICCI Tourism Committee and Chairperson & MD, Lalit Suri Hospitality Group, at the addressing the inauguration of the summit. The event commenced on July 28 in New Delhi after a speaker session which was graced by Vinod Zutshi, Secretary, Ministry of Tourism, Govt. of India, Suman Billa, Joint Secretary, Ministry of Tourism, Govt. of India, Ramesh Abhishek, Secretary, DIPP, Govt. of India, Nikhil Sahni, Senior President – Government Banking & Strategic Government Advisory, Yes Bank, Dr Didar Singh, Director General, FICCI. 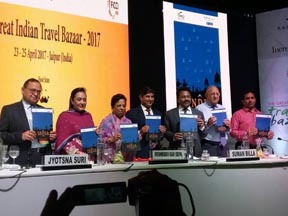 On the occasion, the dignitaries released the FICCI-YES Bank knowledge paper on ‘Investment in Tourism Infrastructure: Unleashing the Growth Potential’. Representatives from the tourism departments of Chhattisgarh, Rajasthan, Karnataka, Delhi, Punjab, Madhya Pradesh and Telengana were present to showcase projects in a bid to attract more private players. Through the private public partnership model, the summit aims to harness the enormous investment opportunities offered by the tourism sector.